If you have tried sky diving, hot air ballooning, race-car driving – maybe white water rafting – and none of these adventures significantly elevated your heart rate, look to the sea, and consider swimming with the sharks. Our personal favorite locations for diving with the sharks are off the beautiful islands of the Bahamas, which are an easy plane ride from the US mainland. We particularly like the island of New Providence which is home to the town of Nassau where 80% of the Bahamians live. At the opposite end of the island from Nassau is Stuart Cove’s Dive Center – one of the very best in the business. Stuart Cove has been involved in the making of many underwater film segments including those from the popular James Bond series, For Your Eyes Only, and Never Say Never Again. Stuart personally certified Sean Connery and Kim Bassinger for their underwater scenes in the later movie. Through the years, Stuart has been host to a long list of celebrities and prominent world figures including Diana Princess of Wales, and the Princes William and Harry. 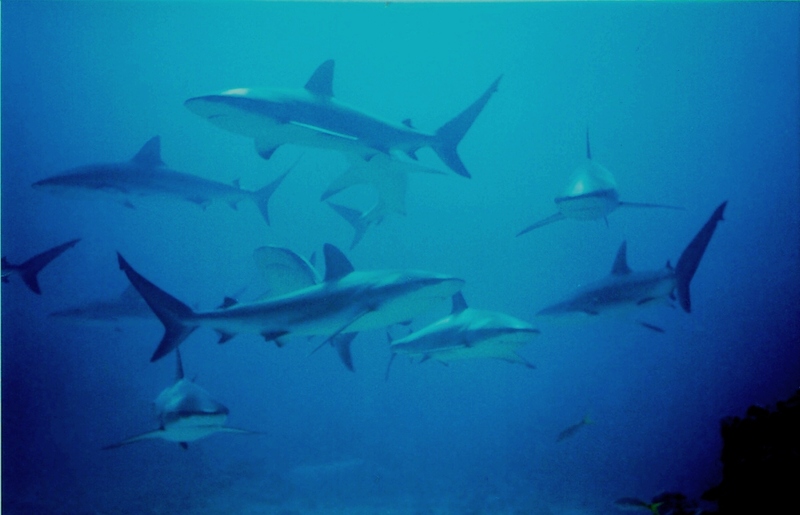 Next to the stingrays in the Cayman Islands, the Caribbean Reef Sharks in this part of New Providence waters are probably the closest thing to a trained fish that you will find anywhere on the planet. They are fed regularly by the shark dive tour operators and know exactly when to congregate for feedings. During a shark feeding, all divers are required to kneel on the bottom in a semi-circle with their arms folded. 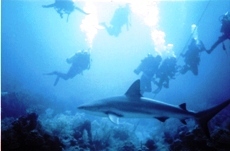 The dive master, outfitted in a chain link suit, kneels in front of the group and dispenses large pieces of fish to the swarming sharks from a bucket via a metal pole. The process is often quite orderly with each shark waiting its turn for a quick gobble. The rhythmic motion of the feeder and sharks is somewhat reminiscent of a matador finessing a cape across the horns of a passing bull. Organized shark feeding is not without its critics. There are those that believe that any form of unnatural feeding of animals in the wild should be banned. 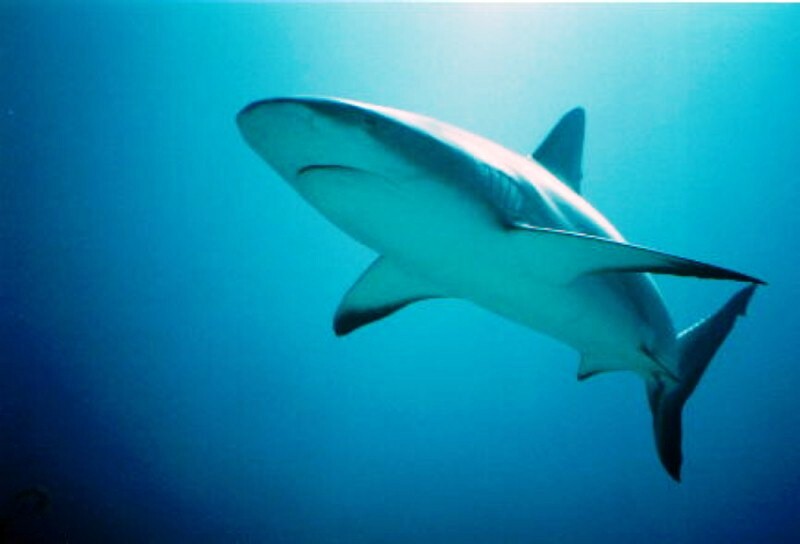 However, we have never observed any behavioral differences between these local sharks and those of the same species in waters where there are no recreational feedings. We hasten to add however, that we are not naturalists or shark experts. As interesting as shark feedings are to watch, we have the most fun well before the feeding when we swim among the gathering sharks. Their eerie luminescent lime green eyes follow divers as they swim past. They seem to be as curious about humans as we are about them. 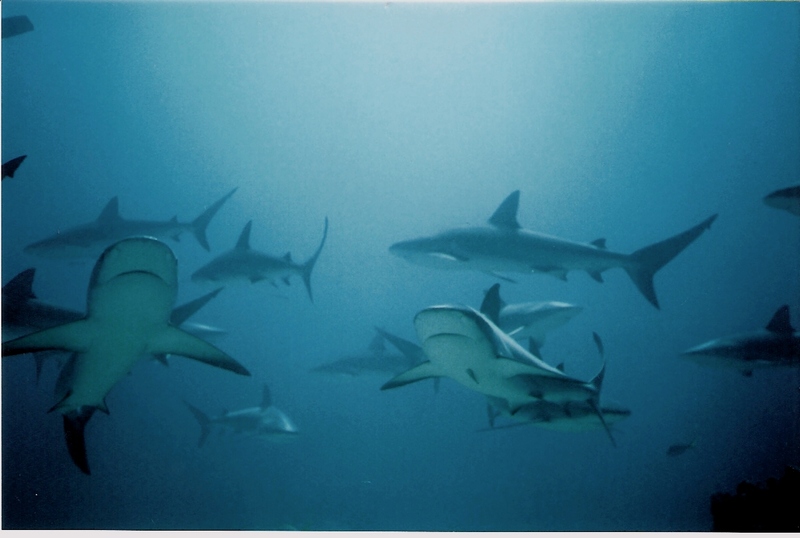 Fear dissipates quickly when you swim among sharks and learn to appreciate their grace and beauty. Of course, not all sharks are created equal. 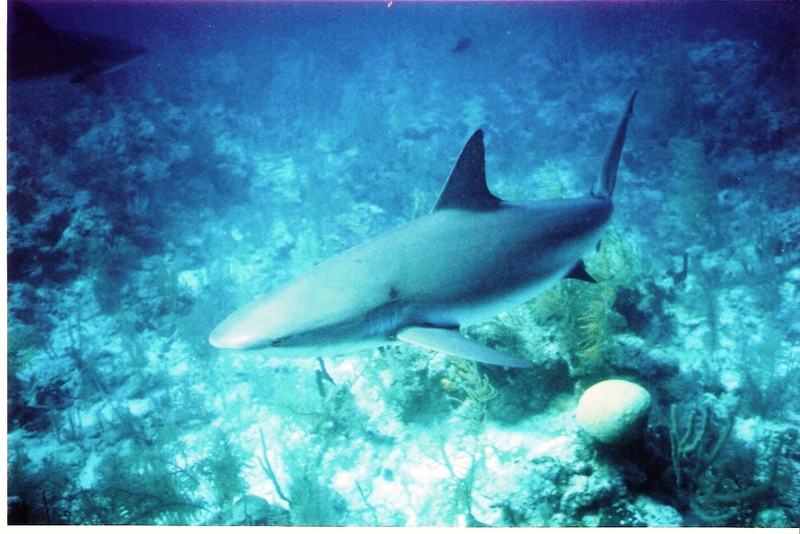 The favored Caribbean Reef Shark runs in size from five feet to nine feet, is olive gray to grayish brown in color, and is quite inquisitive, but not particularly threatening. If you decide to try a shark dive holiday, your expectation and affirmation of safety lies in the fact that professional dive tour operators have been dispensing electrifying experiences to eager divers for years – and as far as we know – there have been no tragic consequences. You need to be a certified SCUBA diver in order to participate in shark dives, but most warm water resorts – and many cruise ships – offer certification courses that will have you trained and ready for action within a few days. ← Wayne and Judy are Syndicated!